Reliance Company’s Mukesh Ambani revealed the tariffs for Reliance Jio 4g at the Reliance AGM. The company gave some clarity on the tariff plans compared to other competitors, there are no charges for voice calls and for 4G data the company will be charging only a 10th of what the other participants are charging. Ambani said- it was declared that Jio will charge 5 paisa only per mega byte and per GB Rs 50. The surprise element is more the usage lesser the cost and the charges could be reduced to Rs 25 per GB. Ambani also declared at the AGM that JIO services will be accessible for free as JIO welcome offer from 5th September (Monday). Everyone can try JIO services for free. You are eligible to pay for only one service that can either be voice or data, all voice calls for Jio customers will be non chargeable, whereas other operators around the world charge separately for voice, data and messaging. Regardless of rumors data consumed on JIO’S apps will be charged against your balance. Apart from the entry level monthly plan you get to enjoy unlimited 4G data from 2AM-5 AM on all the plans. 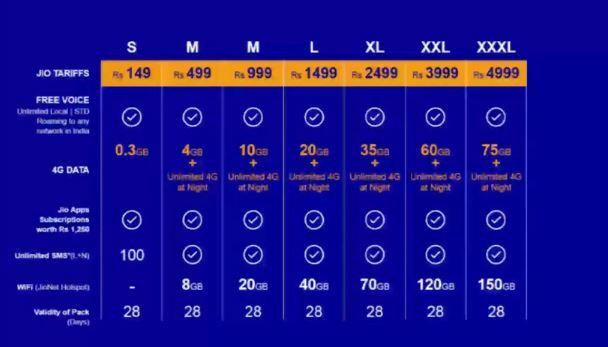 The tariffs for JIO 4G begin at entry level plan of Rs 149 of 300 MB for 28 days, 4GB of 4G data at Rs 499 and a bonus of unlimited 4G for 28 days at night. It does not end here you will also access 8GB from Reliance Jio’s impending network of Wi-Fi hotspots, and you can also increase the data to be used. The 10GB of 4G data will be getting only at Rs 999 including 20GB of Wi-Fi access and also unlimited LTE internet at night. Additional 4G plans vary from Rs 1,499 for 20GB and Rs 2,499 for 35GB, Rs 3,999 for 60GB and double as much Wi-Fi usage correspondingly. The high usage plan is available 4G plans for Rs 4,999 for 75GB with unlimited 4G access at night plus 150GB of Wi-Fi data. For postpaid plans you will have to pay taxes as per norms. Other plans were not discussed in the presentation but they are very much a part of Reliance Jio’s 4G services. Apart from other monthly plans there is one more plan for single day validity at Rs 19 for 100MB data, with unlimited usage at night. There is another plan at Rs 129 offering 750MB and 1.5GB of Wi-Fi data along with unlimited night usage with validity of 7days, and at Rs 229 enjoy 2GB data for 21 days. All these three plans are only for prepaid users. The rates are slightly different from Rs 50 for 1GB that was declared according to these plans. Cheaper plans are expensive for Rs 149 you get data of 300MB and a GB at Rs 450. Though with other plans once you add up the Wi-Fi hotspot data it comes up to the rate that was declared, like a pack of Rs 499 comes with 12GB with Wi-Fi summing up to Rs 42 per GB. Bigger packs lesser price, like a pack of Rs 4,999 gives 225GB with Wi-Fi which sums up to Rs 23 a GB along with unlimited night usage of 4G which is not accounted in this plan. No roaming charges applied across India to any network as declared and also he declared that No more blackout days means no extra charges for SMS or voice call etc on any special occasions. Domestic voice calls are free as said by Mukesh Ambani. Voice calls are free (Local and STD) for all networks not just Reliance Jio users. Mukesh Ambani also stressed that data should be made affordable for all customers/users. Current trend charges users at base rate ranging between 4,000 and 10,000, where as Jio will have 1/10th of the base rate. He also said that the data plans might be accessed at valuable rate of 5p per MB or Rs 50 per GB. Added advantage for students they will enjoy added 25% data on the tariffs by providing valid ID while signing up for Jio. Other than data tariffs Mukesh Ambani also declared that full set of Jio apps for music, live television and new movies will be totally free for all JIO users till December 2017. Enjoy the new wave of Broadband services. If you install Myjio app in your mobile its displaying three Reliance Stores in Hubli – U Mall, Reliance Digital, Vidya Nagar, and Deshpande Nagar. If you want to get Jio SIM from Dharwad city then you can approach reliance Digital which is located in Jublee Circle Dharwad. Visit Reliance JIO website for more information about plans and tariffs.